bit reduction and reconstruction modules. The graph shows the input (ramp) and the outputs (Msb - top, Lsb - bottom). "there are only 8 bits there and the purpose of it was to be able to rearrange the bits or perform some other operation on a few of them." 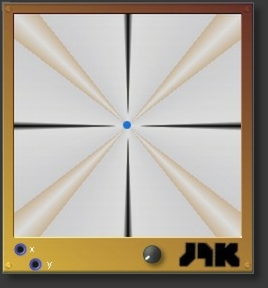 j9k: "it uses sin/cos lfo to rotate a vector image. the demo is in an m2 shell but wth m3 mdl's. 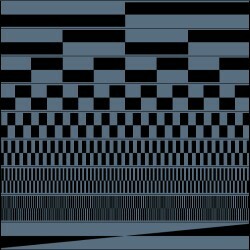 the xfade mdl's push the image into the proper quadrant for amplitude modulation." => Modular’s MidiOut will transmit the values as MidiCC data. sine(out) / cosine(out0) lfo with integrated envelope. 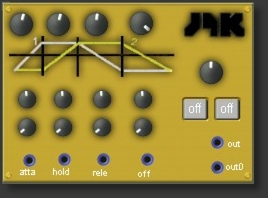 The big knob under the J9k logo controls the lfo rate. The two >off< buttons have to be pressed to get an output. Unfortunately they don’t work no more in SFP4.5. Workaround: Midi CC to engage the buttons. visualization of the two signals connected to the inputs. outputs -2147483647 when an incoming waveform is headed up.